Home / Field Geeks / Football / College Football / Can Ohio State Overcome Everything? Can Ohio State Overcome Everything? I think it is a legitimate question. The team has lost a player to an apparent suicide, and they have their 3rd string quarterback is now their starting quarterback in a huge game with huge implications. 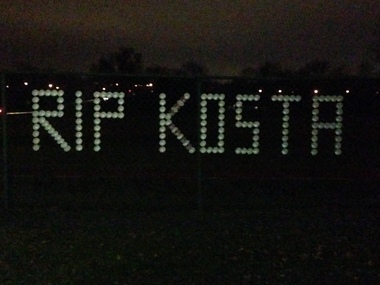 A heartfelt message in styrofoam cups. Picture by Doug Lesmerises. First you have the tragic story of Kosta Karageorge. Karageorge, 22, was an Ohio State walk-on football player and former Buckeye wrestler. He was found dead Sunday, four days after he was last seen leaving his apartment just south of Ohio State’s campus. A few days prior to his death he had apparently sent a text message to his mother apologizing for the fact that he was a failure. Multiple reports talk of him suffering from several concussions and some reports even suggest that he was still suffering ill effects from the concussions. Family, friends and team mates attended his funeral on Wednesday, and test results that are being conducted on his brain will be released in about 4 weeks. He was loved by many, as shown in a display in the football field fence with styrofoam cups at his high school, Thomas Worthington High. At quarterback on Saturday the Buckeyes will not have Braxton Miller or J.T. Barrett. Because of injury, they will be forced to go with their 3rd string quarterback Cardale Jones. It is his 1st start ever on a college football field, and it is not like he is getting a warm-up game. This is the Big Ten Championship. If Ohio State wins, they may be able to propel their way into the top four teams and therefore be able to participate in the first ever 4 team play-off. A loss means they will have to settle for a top bowl game instead. No pressure, no pressure whatsoever! In my opinion when teams are put under this kind of pressure they have 2 choices. They can either fold, or flourish. Folding as in just allowing the emotions of the hand dealt to you to fold you like a bad hand of cards. Slam them on the table and give up on your first move. Or they can flourish. They can go “all in” bet everything they have knowing that they do not have the best hand at the table but believing that their hand is good enough to make a few plays, have a little luck and in the end be able to strategically pick up what they need to pull off the victory. We will see Saturday evening what the result is. And I hope if they win, the dealer (or in this case the selection committee) rewards them with a big pay-off.